A World-Class X-Ray System for demanding hospital radiology departments, orthopedic and urgent care clinics or imaging centers. Easy to read LCD shows SID continuous to table-top and table receptor with discreet SID of 40" and 72" to the wallstand. 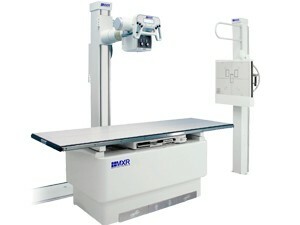 10 foot floor track allows for off-table and weight bearing exams and is customizable down to 8 feet. • Designed for all types of applications, available in 400lb and 650lb patient capacities. • Flat, four-way floating top permits easy transfer and positioning of patients. • Four pedal design allows for easy accessiblity to table lock release. • Collision-protection electronics and fail-safe locks ensure safe operation. • Easy to read LCD shows SID continuous to table-top and table receptor with discreent SID of 40" and 72" to the wallstand. • Cross-table views are easily accomplished using the rotational and transverse positioning capabilities. • 10 foot floor track allows for off-table and weight bering exams and is customizable down to 8 feet. • Center mounting or side mouting of Bucky makes this wallstand flexible for any patient application or installation limitation. • Ergonomically designed hand control for ease of positioning wall receptor. • Side-mounted handgrips stabilize patients during standing exams.